Receptacle has stainless steel arm spring, terminal screws and assembly screws. The sequential contact engagement prevents a momentary over-voltage. It has nickel-plated brass cover screw/rivet and brass ground/phase sleeve. It has rynite SST35 cover arm/cord clamps and polycarbonate rotating sealing disc. 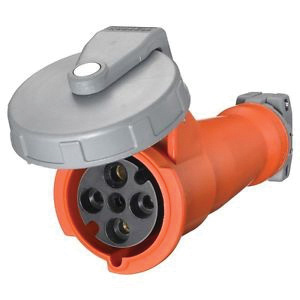 Receptacle withstands temperature range of -40 to 75 deg C. It has IP67-degree of protection. It is UL94 HB or better flammability rated to withstand harsh environmental conditions. Receptacle is UL listed, CSA/IEC certified and RoHS compliant.